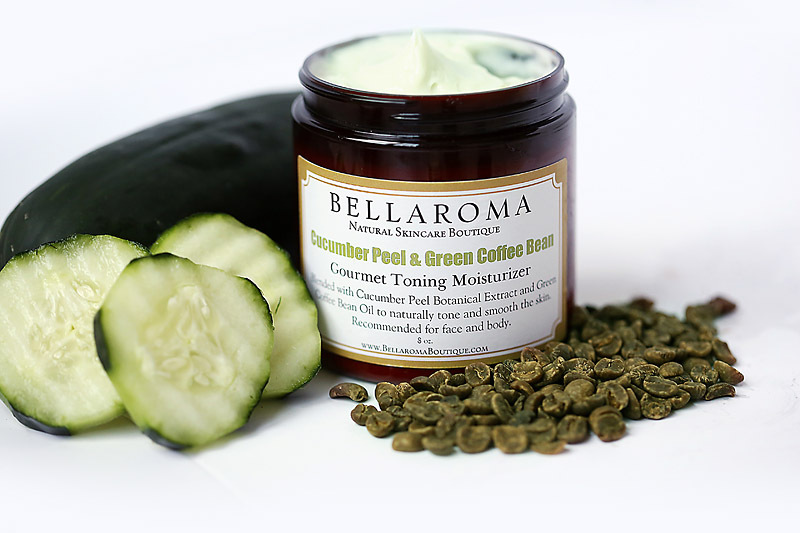 A naturally toning moisturizer blended with a green mix of cucumber peel botanical extract and Brazilian green coffee bean oil. This magical duo is suitable for all skin types, but especially for mature-aging skin as it helps to improve elasticity by toning and encouraging regeneration of skin cells. Apply the toning moisturizer to the face, neck and/or body to help tighten fine lines and aging skin. Disclaimer: At Bellaroma, we formulate healthy and non-irritating products for the skin using all natural and organic ingredients. However, we highly suggest you carefully review the full ingredients list before placing an order, especially those who have skin allergies and/or sensitivities. We are not liable for any reactions you may receive. Product information is not intended to diagnose, treat, cure or prevent any disease. Content on the Bellaroma Natural Skincare Boutique website is provided to help you choose which products are best suited for your skincare needs and any information and/or general recommendations provided should not be considered as medical advice. If you have questions about a particular health condition, please consult your physician or healthcare provider. Comments and feedback about product effectiveness are based on customers' opinions and should not be substituted for medical care. Information on this website have not been evaluated or approved by the Food & Drug Administration.